How is design best illustrated through the project? The design solution incorporates displays depicting the JCI brand and culture throughout all areas. 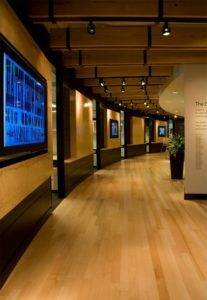 Examples of their product: magazines, photography, and website design are illustrated in the lobby area and on monitors in the walking gallery leading to the presentation conference room. Personalized photographs of award-winning employees hang in the sales area; portrait and text from founding owner Alex Haley is prominently displayed at the end of the gallery; employee photography work is displayed like a filmstrip on the walls of the production area. The employees and clients of Journal Communications, Inc. are always aware of the company’s mission and values. What was the biggest design challenge and how was it solved? During the initial design phase of the project, it became evident that there were definitely two distinct groups in the organization with different personalities. The sales group was very professional and needed a more structured environment, while the production staff was more creative and wanted collaborative space. The design addresses these distinctions while creating a cohesive aesthetic. The sales team is located on one side of the gallery with a more conventional office arrangement, while the production team is on the other side in an open office teaming layout. Community space is located between the groups to join them together. What was innovative or unique about the design process? Since Journal Communications, Inc. was moving from a disjointed, run-down, old office space to a new office environment, it was critical to determine the true needs and not dwell on the extremes of what they did not have in the old space. By interacting early in the progress with a cross section of the organization, we were able to encourage them to think about the new space in an abstract context, which allowed for new ideas to surface. The result was a space designed to truly meet their functional needs. How did the design make a difference and what are the measurable impacts of your work? The new offices for Journal Communications, Inc, in Franklin, Tennessee have changed the way that the employees interact with each other to improve their productivity and enjoy work. Additionally, the space has become a sales tool, helping them win new business.